As a director of enterprise I am often accused of helping to privatise the NHS through the back door. So I was heading off to a meeting in Bath this week and while on the train I sort of drifted off into a state of mixed slumber and reflection. I guess this particular daydream was triggered by yet another episode of someone accusing me of helping to privatise the NHS. I imagined myself in a courtroom with a jury on my left and before me sits a judge, you know the really stern kind with a white curly wig and long robe. Hmmm, well that’s a point of view I suppose. I stand up to address the judge and jury. “Not guilty, your honour,” I reply, and propose this first exhibit in my defence. “I accept that companies need to make a profit in order to be able to innovate, but actually this profit is simply a dividend on the risk they take with their own money (and not the tax payer’s money incidentally) to develop new products that actually make people better. If the products don’t make people better I put to you that no one would buy them. “And your honour, should any company get too greedy and want to make excessive profits from the NHS, this would simply have the effect of stimulating a rival company to make better, cheaper products. Unless of course there is a monopoly situation and the market is unable to function properly. “In fact your honour, I would go further and state that the NHS could be accused in places of tacitly accepting monopolies by dealing with too few large companies, therefore depriving the tax payer of a market that drives down prices, stimulates innovation and provides value to the taxpayer. “I now refer to exhibit two, your honour. I accept that the NHS is about 80% funded by money from the said tax payer. However, first of all the majority of tax payers now work in the private sector, so companies are indirectly paying for the NHS via income tax and national insurance on their employees’ salaries and, in addition your honour, I put to you that a further 8% of the NHS’s funding comes directly from tax on corporate profits. 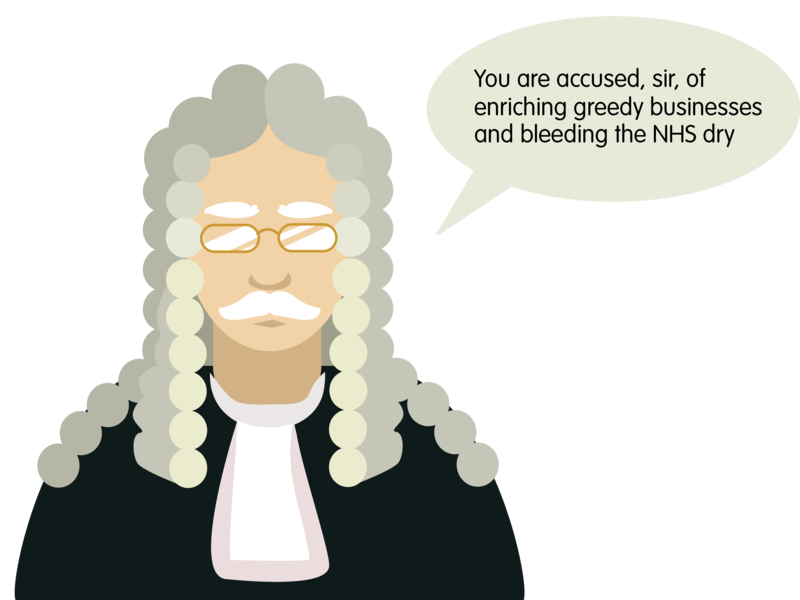 “Therefore your honour in summing up my defence, I plead not guilty of privatising the NHS, but I do plead guilty to the accusation of helping companies make a profit from the NHS. “I also put to you that a virtuous circle exists where increasing the number of people paying tax via enterprises helps fund the NHS, so that the NHS can return more people to the labour markets and thus pay more taxes. “Therefore I put to you that best way to keep the NHS free is to help enterprises make a profit and grow, including making money out of working with the NHS. At this point my train pulled in to the station and I woke out of my daydream not knowing whether the jury might find me guilty or not. I’ll leave that up to you to decide!